Added serial port | What's All This Brouhaha? 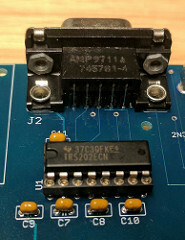 I’ve added the DE-9S connector, TRS202ECN transceiver (equivalent to MAX202), and ceramic capacitors, which make up the TIA-232-F serial interface. The serial interface uses a female connector and is wired as DCE (Data Communication Equiment) to facilitate direct connection to a USB-to-serial adapter. Not shown: two trace cuts and two orange jumper wires on bottom of main PCB. Next I’ll need to get a VHDL UART working with my 1802 core.